Durban, South Africa May 2, 2017 – The Schwab Foundation for Social Entrepreneurship and the Bertha Centre for Social Innovation & Entrepreneurship at the University of Cape Town Graduate School of Business are launching the report, Beyond Organizational Scale: How Social Entrepreneurs Create Systems Change, today at the World Economic Forum Solutions Summit, taking place in Durban, South Africa. 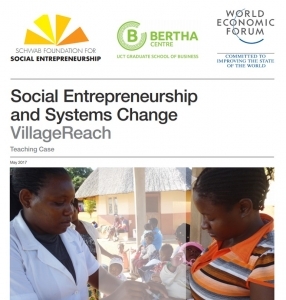 The objective of this report is to help practitioners understand what systems change means in the context of social entrepreneurship, how it is distinct from direct service or “business-in-a-box” models and, most importantly, what it looks like in practice – not as an abstract concept, but as a set of activities, processes and leadership lessons. The report was more than a year in the making, and made possible by the support of The Motsepe Foundation. The stories profiled in the report follow six for-profit and non-profit social entrepreneurs in the Schwab Foundation network, working in education, health, consumer rights, land rights, rural development and the informal economy, as their strategies evolved beyond organizational scale – extending the reach of a prescriptive, organizationally designed solution to a problem – to systemic scale, with the goal of shifting the rules, norms and values that make up social systems. Ultimately, this report and the accompanying in-depth case studies provide an opportunity for social entrepreneurs, funders and policy-makers to begin sharing a common language on systems change and generate momentum for more systems-change strategies and approaches.